Bonjour à tous – Kia ora everyone – An invitation from Jean-Victor Martin, Director of the Alliance Française, for a soiree this Friday October 29, at the Alliance, The Dominion Building, Victoria Street. No RSVP needed. Fiona Kidman (Randell Trustee) is speaking on behalf of the cottage residency. Our next Apero Time (aperitif hour) will take place on Friday 29th of October, from 5.30 pm. 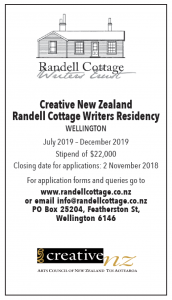 The guest will be the “team” of Randell Cottage and the Service Culturel et de Coopération de l’Ambassade de France, who will introduce the new writer in residence : Yann Apperry. Your presence will be much appreciated.